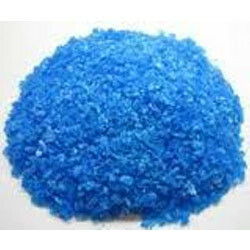 Copper(II) sulfate is the chemical compound with the formula CuSO4. This salt exists as a series of compounds that differ in their degree of hydration. The anhydrous form is a pale green or gray-white powder, whereas the pentahydrate (CuSO4·5H2O), the most commonly encountered salt, is bright blue. Copper sulfate exothermically dissolves in water to give the aquo complex [Cu(H2O)6]2+, which has octahedral molecular geometry and is paramagnetic. Other names for copper(II) sulfate are "blue vitriol" and "bluestone".